(Trumpets flourish in the background.) Today is officially day six of Torture Very Special Agent Anthony DiNozzo Week! Then DIVE, DIVE! 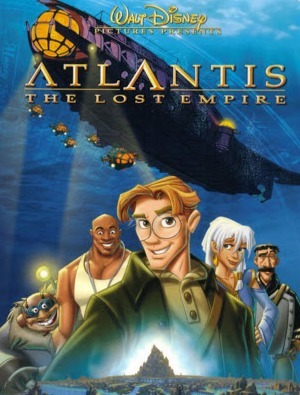 We are going to Atlantis: The Lost Empire! I told it you it would have something to do with Disney! You’ve never heard of the film? I’m not surprised. The movie was a theater flop, so much so that Disney swept it under the rug and cancelled the television series which was supposed to follow it. Why the movie didn’t do so well in the theater depends on who you ask, but most people seem to agree that the film’s action was too choppy. The lack of standard Disney songs is also thought to be a part of the movie’s downfall. I can’t say that I disagree with the action being a bit jumpy. Scenes seem to cut off just before they’ve started or wear out their welcome in a matter of seconds. All the same, though, the film does have its perks. One of these is the hero of the story. Milo James Thatch, the grandson of a famous (or infamous, in some circles) explorer, is trying to convince the board of directors of the Smithsonian Museum that the city of Atlantis actually existed. But Milo fails to gain any support from the museum board for an expedition to the lost city. Later that night an old friend of his grandfather’s offers him the chance he’s been fighting to get, and Milo takes the opportunity faster than greased lightning. The journey to Atlantis is reminiscent of Jules Verne’s Journey to the Center of the Earth, but in abbreviated form. Once Milo and his team finally reach Atlantis, they’re met with a huge surprise. There are Atlanteans still inhabiting the ruins! In Atlantis Milo quickly makes friends with, and falls for, one particular Atlantean woman: the Princess Kida. There’s a lot more to the plot but I’ll leave you with these bare basics because I want to make a special mention about Milo. When Milo is called on by his grandfather’s old friend, Mr. Whitmore, he doesn’t come to see Milo at his apartment in D.C. Whitmore is a millionaire, so he can afford to have Milo come to him. The way he chooses to do this is by sending a very pretty young woman to pick him up. Thing is, Milo doesn’t bite at this woman’s (Helga Sinclair) beauty. Part of that may have been because his apartment was empty and he had no electricity, but that still doesn’t quite explain why she didn’t leave him speechless. Oh, there’s no way she’d have left you speechless, DiNozzo. At least not until she started talking; Helga Sinclair does not bandy words when her prey is in her grasp. You are so dense! A beautiful woman waiting for you in your dark, empty, cold apartment and you don’t smell trouble right then and there? Anyway, the fact is that Milo doesn’t fall for her. This is a good thing, but you’ll have to watch the film to find out why. Now Kida, I will have you know, is no slouch in the beauty department. Nor is she a damsel in distress. Well, not in the physical sense; this princess can look after herself if necessary. This makes her something of a contrast to Milo, who is your stereotypical bookworm. He’s skinny as a rake, has a hard time getting to know his teammates (who at first largely look down on him), and he wouldn’t win any contests for strongman. Besides the obvious physical differences, the two have what appears to be opposite personalities. Kida is outgoing, enthusiastic, and often takes things from Milo without asking (such as his glasses) in her eagerness to find out how something works. This is probably because she’s a princess and is used to getting her way without having to ask. That and what was considered politeness in Atlantis thousands of years ago isn’t what is considered polite in 1914. In contrast to Kida, Milo is reserved, polite, and often fails to observe his surroundings. Part of what makes it hard for Milo to connect with the members of the expedition is his penchant for going off on a tangent in a conversation. Once, while marveling over a pillar that stands in the expedition’s path, Milo is so wrapped up in his archeological diatribe about it that he fails to realize that the demolition’s expert for the group is laying charges around its base. If he hadn’t been pulled back by the demolition’s expert, Vinny, he’d have ended up joining the pillar he found so fascinating. So what do you think ties him and Kida together? The search for knowledge. In the thousands of years since Atlantis was sunk (why else would they have to make a Journey to the Center of the Earth-style expedition to find it, Tony?) Atlantean culture has all but crumbled away. Kida has witnessed this firsthand. Her father is too old to leave his throne room, and so he has not seen it. Kida, though, has spent years leading her people on scavenger hunts into the tunnels that lead to Atlantis. She has watched while the others fish in what remains of the city’s central harbor. She has seen the city disintegrate with time, and the culture’s knowledge with it. So when Milo shows her the book that guided him and his expedition to Atlantis, Kida is flabbergasted because no one in Atlantis can read anymore. This is proved when Kida looks at the open pages of the book reverently but without understanding anything on them. The other part of the search that pulls her and Milo together is that no one remembers why Atlantis sank. Kida has a personal reason to want this knowledge, but I’ll let you see that for yourself. She’s probably the only one on the planet who could get away with giving him such a verdict on his pronunciation in that particular manner! It is this thirst for learning that brings him and Kida together. Physical beauty has no bearing on the inner beauty of a man or woman, something Milo knows by instinct if he cannot articulate it. That is why Helga fails to lure Milo in and why Kida is able to catch him. Helga is stunningly beautiful but she has no desire to learn anything more than what’s necessary for her to gain the life of luxury she wants. Oddly enough Kida, the woman born with the proverbial silver spoon in her mouth, has the passion to learn and keep learning when as a princess she does not have to. Animation and lack of typical Disney songs aside, the movie scores in the way it brings evil crashing to the ground and restores good to the throne. But when Disney is counting its film heroine Mulan among the ranks of the franchise’s fictional royalty (Mulan is NOT royalty in any way, shape, or form), it feels a little bit like a slight to the fans. The argument can also be made that certain other Disney characters deserve billing with the more popular royalty: Giselle from Enchanted; Simba’s daughter Kiara; and Ariel’s daughter Melody are also not included with Snow White, Cinderella, Belle, etc. So at least Kida is in good company. She’d be in better company if Disney listed her with its more popular princesses, but beggars can’t be choosers, right? On that note, then, I leave you until tomorrow, my tortured DiNozzo! This entry was posted in Movie Reviews and tagged Atlantis: The Lost Empire, Disney Princesses, Joss Whedon, Milo Thatch, Movie Reviews, Princess Kida on August 23, 2013 by The Mithril Guardian.